First thermal imaging cameras were used for military purposes during the Korean War, but they evolved since then and nowadays they are used for many everyday tasks and jobs. Firefighters use them to detect hotspots of fires and to find people trapped in the fire. Law enforcement uses them for investigations and rescue operations. There are many situations and activities where a thermal imaging camera could be used, from professional tasks, like the ones mentioned above, to home appliances. Different situations require different tools, and you’ll need a specific type of thermal imaging camera depending on the task you’ll be handling. Flir TG165 is a thermal camera designed primarily for light to medium household tasks. 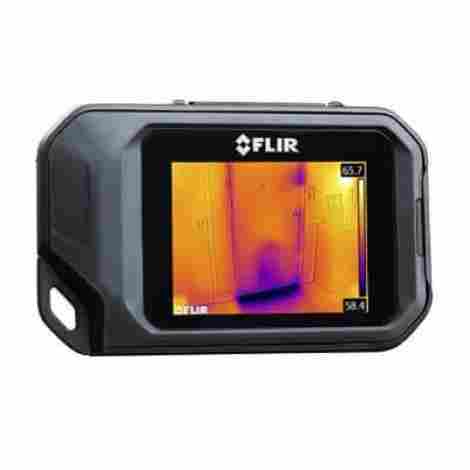 It produces high-quality images that will help you detect any thermal issues in your house – Flir TG165 will not just notify you about the object’s temperature, but it will show it to you as well. Basically, this thermal camera is a compactly designed tool that will make you the coolest handyperson in the entire neighborhood! The camera features a dual laser targeting system which provides a high level of precision. An IR thermometer gives a non-contact temperature reading, while a thermal imaging device shows the relative thermal properties of an aimed area in the context of its surroundings. The camera also has a spot ratio of 24:1 which means that it measures the temperature of a spot 1 inches in diameter. It detects object temperature at a range from -13 to +716°F. Flir TG165 works perfectly on wide areas – it can scan the entire wall if you need it to. We can say that the downside is a quite low resolution (4800 pixels) but you should keep in mind that this tool is primarily designed for small household situations. Flir TG165 is a very easy-to-use device. You can use it right from the box, without even having to read the instructions or search for a youtube video that would guide you step by step through the installation process. Things are simple with Flir TG165! The camera can store about 75000 images on its 8 GB SD card, but if for some reason this isn’t enough for you, the 32 GB SD card fits too. The camera is sturdy and durable, it can endure all falls and bumps, although we don’t recommend you to try this intentionally. It’ also water-resistant which is a quite useful feature for those who plan to use the camera on the outside. Let’s not forget that it has a battery that can last up to 5 hours. It’s hard to beat the Flir TG165 camera when it comes to the overall value that it provides for the money. It’s one of the rarely well-priced thermal cameras that will actually give you a high level of performance. Flir TG165 is not the best tool for every thermal imaging situation, but it does wonders with smaller tasks. Seek Thermal offers a tiny camera that attaches to the smartphone and allows you to take a thermal image wherever you are. If you need an all-in-one device that can show you the temperature of your environment at any time, Seek Thermal is just the perfect product for your needs! 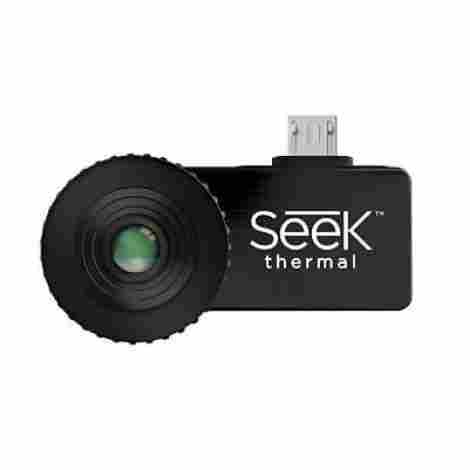 Like we already said, Seek Thermal is a tiny camera that plugs in your Android or IOS device. The camera has a 320 x 240 high-resolution thermal sensor and a wide field of view (24 degrees horizontal and 32 degrees vertical). It detects temperatures from -40 to 626 °F. The shots are not as sharp as they could be and many users complained about the flickering motion of the images on the screen, but if you hold it still for a few seconds before you take the photo, it can achieve good quality. The installation process is as easy as it can be – the phone app launches in the same moment when you plug the camera to your device and you just need to authorize it. The setup takes about a few seconds and you are ready to use the camera. Seek Thermal camera measures 1.6 x 0.8 x 0.6 inches and it weighs 7.8 ounces. It’s clearly compactly designed to fit every phone, but you’ll have to be extra careful not to lose it! A good thing is that you’ll get a waterproof carrying case with a soft rubber interior that will keep the camera safe when you’re not using it. A versatile device like this one can help you deal with tonnes of stuff such as home repairs and security – some people even use it for traveling. You can easily detect any thermal leaks in your house, wandering animals around it or unwanted guests on your property. Yes, Seek Thermal is on the expensive side for a tiny device that attaches to your phone, but look at it in this way: you get a versatile and portable device that allows you to take thermal images at any given moment! Flir C2 thermal camera is very similar to a smartphone – it’s a pocket-sized camera that is extremely easy to use. The compact design allows you to use the camera everywhere, from your house to construction sites. If you’re interested in this popular and quality thermal imaging camera, keep reading our in-depth review and find out all of its amazing features! The camera has a lepton thermal core which provides up to 4800 pixels per shot. In combination with the sensitivity of variations in temperature up to 0.10 °C, this is very impressive. C2 has multiple viewing color modes and MSX technology which helps you to discern object details – it basically draws lines around objects. It instantly takes two photos – one is the thermal view and another is a regular photo, so you can compare them in order to get the full image of the area you’re looking at. Also, the camera is able to store up to 500 sets of images. When it comes to detecting temperature, it ranges from 14 to 302 °F – very useful for discovering electrical and mechanical issues. Another useful feature is a wide angle lens that allows for a big picture to be taken all at once. The only thing that should be improved is a color palette. We were a bit disappointed to learn that only four different color palettes come with this type of screen. The construction of the Flir C2 is rock solid – it’s wrapped in a soft rubber protective shell that keeps the camera safe from any accidental drops. The screen also has a flexible plastic cover material that can endure a lot. You should only be careful with water and dust, but except that, the camera is fully protected. Lastly, the camera has a user-friendly design. It’s equipped with various features that provide easy handling and simple installation. All buttons on the camera are intuitive and big enough for simple and fast clicks. However, the biggest concern of every user is its short battery life – it lasts only for 2 hours. Although the camera has a fast recharge option, most users would rather have longer battery life. 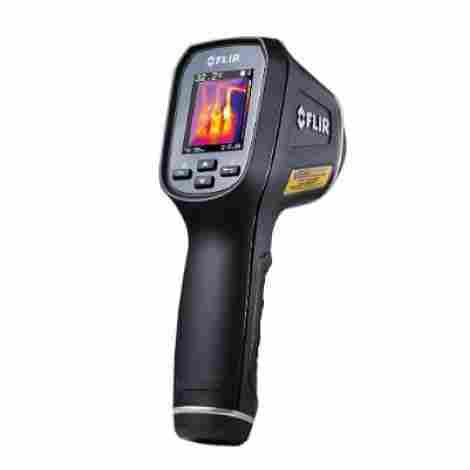 Flir is continuously designing thermal imaging cameras that are in the affordable price range, and C2 is one of them. This camera offers excellent performance and very appealing design - considering its overall quality and price, C2 is a rare find! People find that Perfect Prime IR0018 is a very useful and handy device suitable for many different purposes. 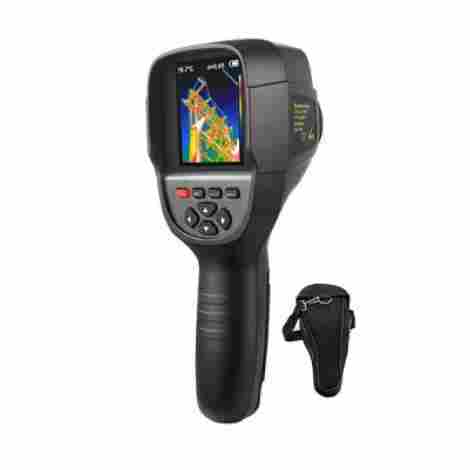 You can use it to search for hot spots in firefighting, termites in your walls, car engine’s diagnosis and for resolving many other thermal issues. In a word, you’ll be quite satisfied with IR008 versatility and high-quality performance! With this thermal camera, you’ll get a reasonable resolution at 220 x 160 and 35,200 pixels. The full-color screen (3.2 inches) shows crisp and clear thermal images. It detects temperatures from -4 to 572 °F. Overall, it has decent power for a handy tool designed to help you with thermal issues around the house or with light industrial tasks. The device has integrated SD card with 4 GB memory, and the photos can be transferred by the provided USB cable. We should mention that this camera has an issue with the high noise level of the sensor. This is quite annoying regardless of the purpose you’re using the camera for. IR0018 is an ergonomically designed camera that enables comfortable handling and easy usage. The setup is quite simple and the buttons are large enough to provide accurate clicks even with gloves. The camera measures 9 x 4 x 3.3 inches and it weighs 1.2 pound – you can notice yourself how lightweight and compact this device is. This will give you the ability to carry it around easily. Perfect Prime IR0018 is surprisingly well-priced thermal imaging camera. You’ll be able to use it for home repairs and industrial tasks yet it doesn’t cost a fortune! If you’re searching for a light device that can help you with every day thermal issues, HTI thermal imaging camera is an excellent choice! 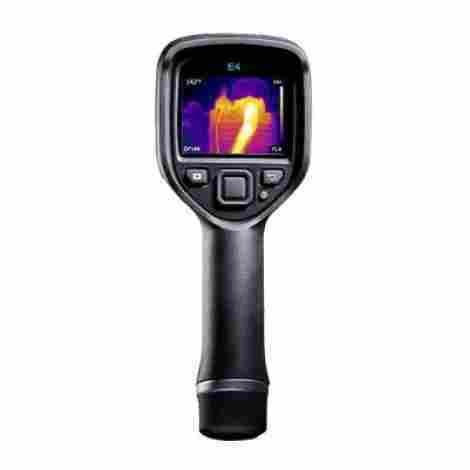 It compares to some of the best thermal cameras on the market yet it’s really affordable. Therefore, people with a limited budget will find out that this device is perfectly designed for their need for a compact and powerful thermal camera! The screen (3.2 inches) displays high-resolution pictures and you’re able to choose a color from a five-color palette. The camera provides 220 x 160 resolution and it detects the temperature from -4 to 572 °F. It allows for accurate temperature readings within 2.5 °F. With all these features, this camera is suitable for handypersons as well as professionals who need the temperature accuracy of a high degree. HTI thermal camera is lightweight (only 0.83 pounds) and it comes with a travel pouch. It’s ergonomically designed to provide easy handling and comfortable feeling even after extended use. It comes with several little essentials such as a USB cable, a 3 GB SD card, and a carrying case. We especially like the included rechargeable battery! Lastly, we should warn you about two possible little issues. The first drawback is a firmly glued camera case that doesn’t allow for battery replacement. The second one is some kind of a connection issue – some users complained about their computer not being able to recognize the device. Like we already said at the beginning, this camera is a real steal! If you don’t want to spend a fortune on a thermal imaging camera, and yet want to have a device that’s powerful enough to provide easy handling and issue detecting, you can’t go wrong with HTI thermal camera. Flir One is labeled as a professional camera, but everyone can use it due to its user-friendly design and versatile features. Flir achieves excellent performance regardless of the situation in which is used. This tiny thermal camera can produce high-resolution photos and detect thermal issues at any place with great ease. Therefore, if you’re a fan of compact yet powerful versatile devices, this might just be the thing for you! 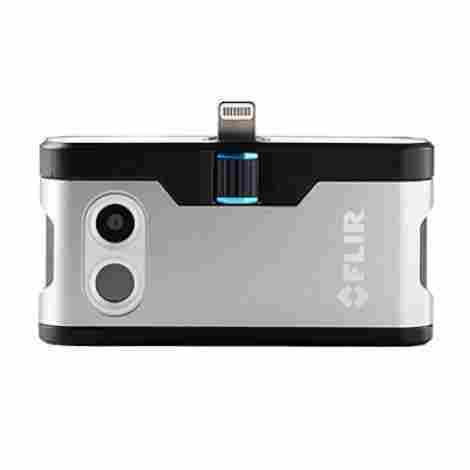 Flir One is a thermal imaging camera that attaches to iOS and Android devices. The camera has a 1440 x 1080 visible image sensor and a field of view of 55 and 43 degrees. Actually, Flir One has a dual camera that allows for more accuracy in taking photos: you can see the thermal reading from an object and outlines of the object itself. It detects temperature range from -4° to 248°F. The only drawback we have found is the battery life. It can operate up to 1 hour or less if you take videos, which is far from impressive. You can recharge it pretty fast though. The setup is quite simple and the interface is intuitive, you’ll be set to take images in no time. When it comes to quality of the materials, Flir One is a sturdy camera, protected from falls and bumps. It also comes with a carrying case for extra protection. Overall, it’s a compactly designed and durable camera that you can take with you anywhere you go. The camera easily plugs in the phone which was great until we noticed that it can easily slip off! It’s a bit annoying to worry about losing your camera while walking around and taking thermal images. The manufacturer should definitely find a way to resolve this in the future. Among numerous expensive thermal imaging cameras, Flir One is on the less expensive side. Truth to be told, for a tiny camera that attaches to the phone, this is a pricey device. However, it’s still available for most users, even for regular DIY enthusiast or technophiles that want to try out a new device. Here we have another Seek’s highly functional and quality thermal imaging camera. It’s primarily designed for beginners and DIY enthusiasts that want to seek for thermal issues all on their own. If you’re one of them, you’ll find Seek thermal camera quite useful! The camera has a sensor resolution of 206 x 156 pixels and it measures temperature from -40 to 626 °F. It has a 36-degree wide field of view and allows a quick scan of the problematic area. You’ll also get a first-class battery that can last for 10 hours! It won’t fail you in critical issue-detecting moments. The camera also comes equipped with a LED which works separately of the infrared camera. The only (and big) drawback is the lack of image-combining and video options. 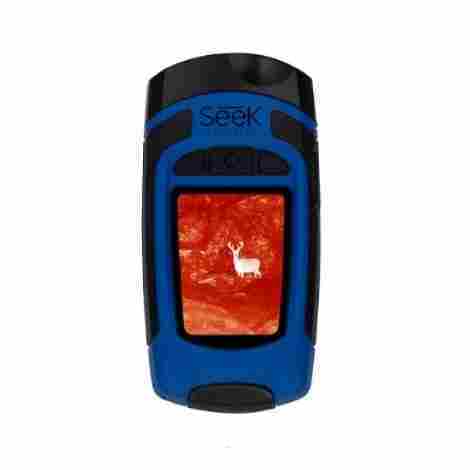 We were very disappointed to learn that this Seek’s thermal imaging camera doesn’t have these essential features. The camera is designed for harsh working conditions, featuring sturdy and durable materials. There are rubberized parts that keep the camera safe in case of any accidental drops. All these features didn’t make this Seek device too heavy – you can easily use the camera and carry it around. There are several command buttons that will set this device to work in a few seconds. You’ll have your compactly designed thermal camera right at your hand’s reach wherever you go. As we already mentioned, this Seek device is an entry-level thermal camera designed for beginners and resolving light thermal issues. People are amazed by its versatility and excellent performance, along with its surprisingly low price. We can say that VT04 is more like a visual infrared thermometer than an entry-level thermal imaging camera. It allows you to detect thermal issues in various situations, including both house repairs and complicated work requirements. Professionals will find this device very useful, as well as DIY enthusiasts due to its compact design and user-friendly interface! With Fluke VT04 we have a combination of a spot thermometer and an infrared camera in a pocket-sized tool. The camera has a field of view of 28 x 28 degrees and a 240 x 320 color display. It’ll show you the hottest and coldest spots in the field of view using hot and cold markers. Therefore, you’ll be able to detect all kinds of thermal issues around the house or industrial site. There’s also a temperature alarm that alerts to values outside the expected range. However, Fluke VT04 doesn’t show the actual temperature of hot and cold points displayed on the screen. You’ll have to point the crosshairs at these specific points to get an accurate measurement. We have to admit that it gets a bit annoying. Just like other Fluke instruments, VT04A thermal camera has an intuitive interface and it comes with a useful introduction and user guide. An SD card is included in the package and it stores up to 10 000 images. Like we already mentioned, the device is compactly designed to fit your pocket. You can easily carry it between job sites or bring it with you while traveling. The only design issue is actually some problem with the software. A few users reported that the software didn’t work properly, so they had to contact the manufacturer. 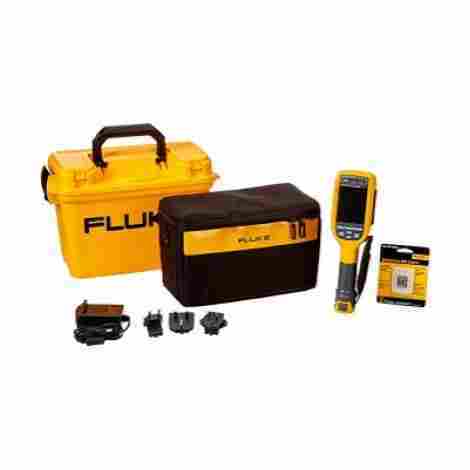 What has surprised us the most is an attractive price of Fluke VT04. For the value that it provides, it’s incredibly well-priced, especially when we consider its versatility and excellent performance. Therefore, we think that buying this high-quality product will bring incredible value to your home and work equipment! Here we have another excellent Flir’s thermal imaging camera. E4 provides an easy way for you to detect any potential electrical, industrial or mechanical issues. Both professionals and handypersons can use it with great ease and accomplish perfect results in resolving thermal problems. If you’re interested in Flir E4 features and overall performance, keep reading our in-depth review! Flir E4 will help you to detect various kinds of thermal issues such as gaps in insulation, leaks in windows and doors and others. It has an image resolution of 80 x 60 pixels – it’s not the best resolution but it will get the work done. This flaw isn’t so disturbing because of the presence of the visible-light camera. It captures higher-resolution images and it pairs them with the infrared images. Lastly, the camera detects temperature from -4 to 482 °F. Flir E4 has rubberized material on the outside that can withstand falls from 6.6 feet. It’s a very durable device that comes with a 10-years warranty. The package includes a USB cable, the charger, a rechargeable battery, and a strong protective case for safe transportation. The Li-ion battery can endure 4 hours of continuous work. Overall, you’ll get a durable and portable device that is designed to withstand harsh conditions and extended use. Flir E4 is one of the high-priced thermal cameras that aim to accomplish perfect accuracy with every type of thermal issues. We can even say that this camera is less expensive than other first-class devices, but the issue of its performance remains – a lower price came at the expense of the image quality. Don’t get us wrong, Flir E4 is still an excellent thermal camera. We just expected to see more from a professional camera like this. 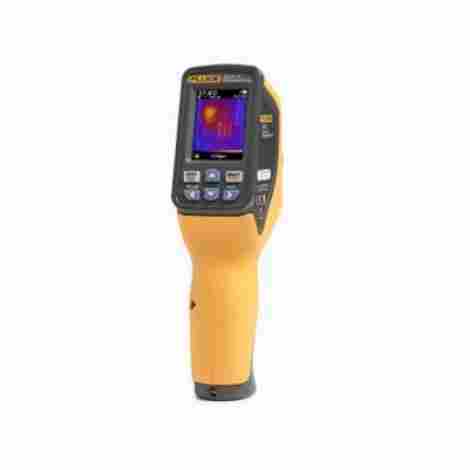 Fluke Ti100 is a thermal imaging camera suitable for industrial and commercial applications. The camera isn’t just offering fast and high-quality performance but it also saves you a lot of time. If you’re eager to find out what’s so special about this Fluke’s thermal imaging camera, keep reading for more information! The device offers various measurements (thermal, mechanical, electrical and vibration) that will help you spot issues faster and resolve them on time. Many users reported that they have used Fluke Ti100 in harsh conditions and for demanding projects and the device was able to deliver excellent performance every time. The camera has 160 x 120 resolution and it can detect temperature from -4 to 482°F. 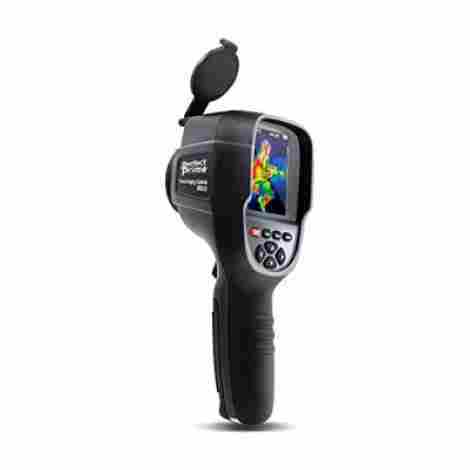 It features an integrated laser pointer that allows for great accuracy in detecting thermal problems. Along with the camera comes a 4 GB SD memory card for more storage. The camera is lightweight and ergonomically designed to be comfortable even after extended use. The buttons are big enough for simple and precise clicks and you can press them even while you wear gloves. This is very useful for construction sites. You also have the ability to use the Fluke Connect app – you can share taken shots with other team members by this smartphone application. The only thing that would improve the overall design is a zoom feature. It’s a minor issue but it would be nice to have it as an option. Considering its design and overall performance we can say that buying Fluke Ti100 will bring you incredible value. The product’s price is sky high but keep in mind that it’s primarily designed for professional usage. Almost every user is more than satisfied with the overall value that Fluke Ti100 brings for the money. As you already know, the overall performance of thermal imaging cameras is the most important thing that one should consider before making the purchase. This was also our number one concern when ranking the best cameras on our list. A thermal imaging camera has to have excellent resolution and it has to detect the proper temperature range to be useful. Of course, there are some cameras on our list that have lower resolution but they offer other features that compensate that lack. After all, while professionals might want to get the best resolution from their imaging cameras, most DIY enthusiasts and handypersons don’t need too much power from it. We tried to evaluate all the product according to their performance but we also had in mind various customers’ needs and requirements. The design of the thermal imaging camera doesn’t seem as important as other essential features such as resolution and temperature range, but the truth is that it has a big impact on the overall quality of the camera. You don’t want to get a camera that isn’t suitable for your storage and transportation requirements. Also, the user-interface design can be very important especially if you’re a professional that needs the buttons to work even if you wear gloves. All of these little things can influence your overall experience and work with the camera. Thermal imaging cameras are very expensive devices so we wanted to be sure that you’ll get the best value for the money. Some of the products on our list are less expensive, and we tried to rank them according to the overall performance and price. Getting a cheaper camera at the expense of some essential features wasn’t enough for us. Therefore, we tried to compare both the quality and price of every product and then rank them according to their overall performance. You can always follow our criteria used in the evaluation of the best thermal imaging cameras to navigate to the best product for your personal needs. However, there are some things you may want to consider on your own. What do you need a thermal imaging camera for? This tool can fulfill various purposes – law enforcement uses it as well as firefighters, industrial workers, and home inspectors. Determine the application first, and then you’ll know what type of thermal imaging camera you need. Although it may not seem that way, compact design of thermal imaging cameras can be very important. If you’re going to keep your thermal camera fix mounted this is not the thing that will concern you, but people who need a portable device have to think about compact design. We know how expensive are thermal imaging cameras, but you need this type of tool to be as good as it can get. If you have some extra money to spend on a new thermal camera, do it! It’ll provide excellent performance and you won’t be unsatisfied with the half-way features that won’t live up to your expectations. On the other hand, if you have a limited budget, search for the best resolution that you can find for the money. You can do this even at the expense of compact design or other additional features because this is less important than overall good performance. Q: What’s the difference between a thermal imaging camera and a night vision (or infrared) camera? A: Thermal imaging cameras are actually sensors that detect heat, not light. On the other hand, cameras that detect visible light can’t see thermal energy. Thermal cameras detect temperature differences in objects or living organisms and translate them into an image. Night vision cameras take a small amount of visible light and increase it in that way that they produce an image completely lightened up by that light. Infrared cameras work with reflected light to make the image. Therefore, the main difference between these cameras is the use of light or heat – thermal imaging cameras are better in certain situations because they don’t rely on the presence or the absence of light. Q: Can I hide from a thermal imaging camera? A: Of course, you only need to block the signal that the thermal imaging camera detects. For example, you can hide behind hills, rolling ground or solid walls. It’s essential to hide behind things that will block your body heat. Overclothing can help too because bare skin emits more heat. You can also look for backgrounds that absorb heat, like rocks. Think about looking for other objects that have a big concentration of heat so you can camouflage your own body heat. Q: Are there any thermal imaging apps for my phone? A: There are various thermal imaging apps for androids and iPhones, and they work similarly to real thermal imaging cameras. Some of the apps are made just for fun, and they can’t really detect the heat, but there are ones that actually work this way. Many of them require built-in sensors, though, so not every type of phone will be able to pull this out. Keep in mind that those apps don’t come close to the abilities of thermal imaging cameras. Q: Why are imaging cameras so expensive? A: Thermal imaging cameras use different technology than visible light cameras. They require unique technology and components that are quite expensive. For example, thermal imaging cameras require a different type of lenses because regular glass can’t work with thermal sensors. Most thermal cameras’ lenses are made from a rare metal named germanium – and rare metal often means expensive metal. Lastly, thermal imaging cameras can also produce heat that can ruin a perfectly sharp image, so they require cooled sensors that will prevent this from happening. We listed only a few features that influence the high cost of thermal cameras, but you can find a wide range of essential features that make this tool unique and consequently expensive.